On June 8th, the city published a Draft Environment Impact Statement (DEIS) for the “city-wide” implementation of the Mandatory Housing Affordability (MHA) program. It’s 462 pages of dense material. Here’s your cheat sheet. First, here’s how this fits into the overall scheme of MHA. A year ago, the city passed the “framework” legislation for MHA that specified how the general mechanism would work of adding additional development capacity in exchange for developers either setting aside a certain number of units at affordable prices or paying into a fund to let the city build or preserve affordable housing. Since then, the city has been working through one-by-one specific neighborhoods on how it would be implemented, including the specific zoning changes and what the affordable housing requirements would be. First they did the University District, then downtown and South Lake Union. They are nearly finished with the Chinatown-International District, and just getting started on the 23rd Avenue corridor in the Central Area. What remains is a large collection of “urban villages” spread across the city, many of which are very small. Rather than define separate legislation for each one, at this point the city will handle all the rest as one large “omnibus” MHA bill. But doing that makes it a large enough change to trigger the state’s requirement for a full Environmental Impact Statement. The city must draft an EIS, publish it, take public comments, and revise it into a final EIS that can be the basis for the legislation. The draft EIS was published on June 8th; the public comment period is open until July 23rd. There is no specific timeline for how long it will take the city to address comments and publish a final EIS, but the MHA legislation for those parts of the city can’t go forward until it’s done. “Mitigation measures,” i.e. actions that could be taken to reduce or eliminate the impacts. The proposed action is, of course, rolling out the MHA program to urban villages: upzoning within the boundaries of each to allow for taller and/or larger-volume buildings, and adding “performance or payment” affordable housing requirements to all upzoned areas. In a handful of areas, the proposal includes expansion of the boundaries of the urban village to surrounding blocks. 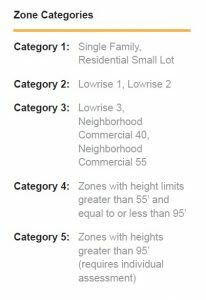 The “study area” extends beyond the proposed upzones, because of course upzoning would affect adjoining areas as well. 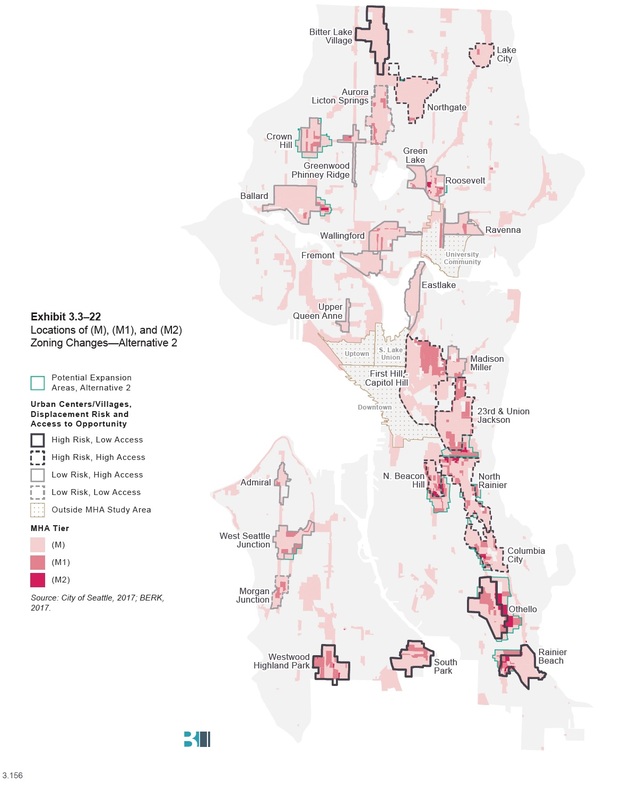 Alternative 3: generally following the guidelines of the 2035 Comprehensive Plan, but concentrating development more in some neighborhoods and less in others depending on risk of displacement and availability of opportunity. Alternative 1 is useful information because the EIS is trying to predict what will happen over the next 20 years. 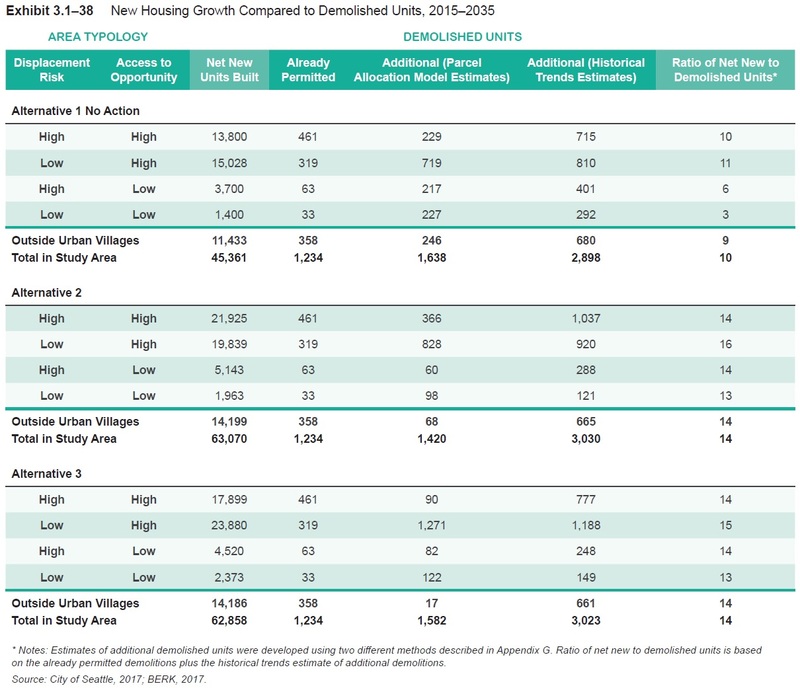 We know that regardless of whether MHA is implemented, there will be substantial population growth in the Seattle area. That will put pressure on a number of public services and resources: housing, transportation, utilities, open space and parks, aesthetics, air quality, etc. 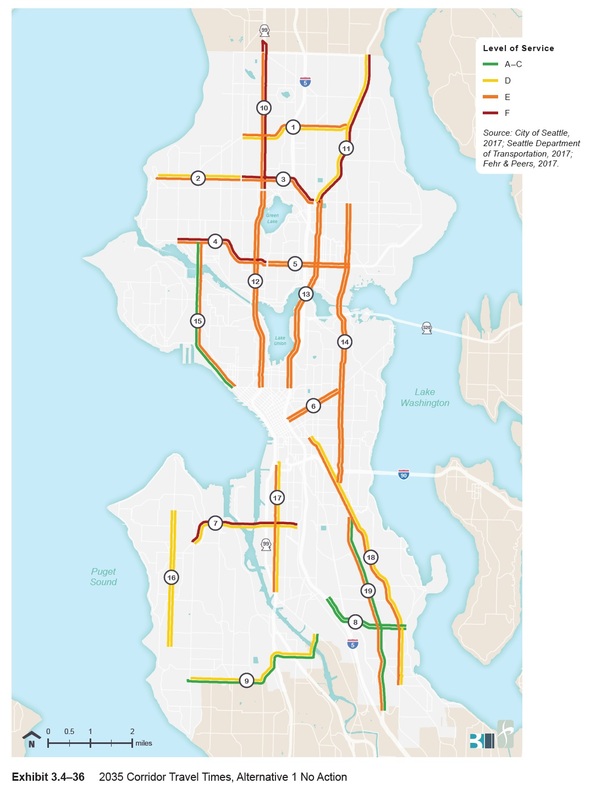 It’s not particularly informative to compare an MHA-implemented Seattle in 2035 with the Seattle of today; it’s much more useful to compare it with the Seattle of 2035 where MHA hasn’t been implemented to understand what difference it will make. That’s what Alternative 1 gives us. Before we go any further, we need to understand Alternatives 2 and 3, what’s common between them and what’s distinct. Concentrate growth in urban villages, by increasing development capacity there to make it more attractive. Concentrate the development capacity in the center of the urban villages, and taper it down to the edges so as not to create a physically and aesthetically jarring transition to the surrounding neighborhoods (which are overwhelmingly single-family homes). Concentrate the development capacity near major transit hubs such as light-rail stations and Park-n-Ride centers. This is called “transit-oriented development” or TOD. Expand urban village boundaries (where necessary) to a predefined walking distance from transit hubs — generally 10 minutes. The four-quadrant graph above is the basis for Alternative 3. 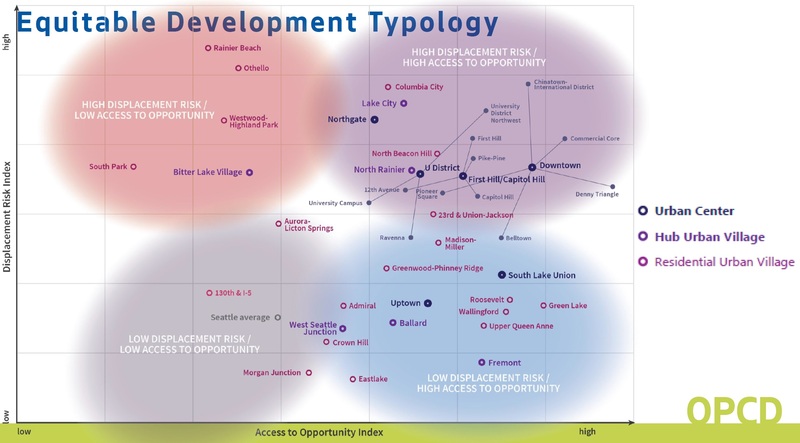 Whereas Alternative 2 takes the Comprehensive Plan and does a straightforward implementation, Alternative 3 pulls back on development in the most fragile neighborhoods (high displacement, low opportunity) and pushes more into the most resilient ones (low displacement, high opportunity) while leaving the neighborhoods in the other two quadrants closer to Alternative 2. 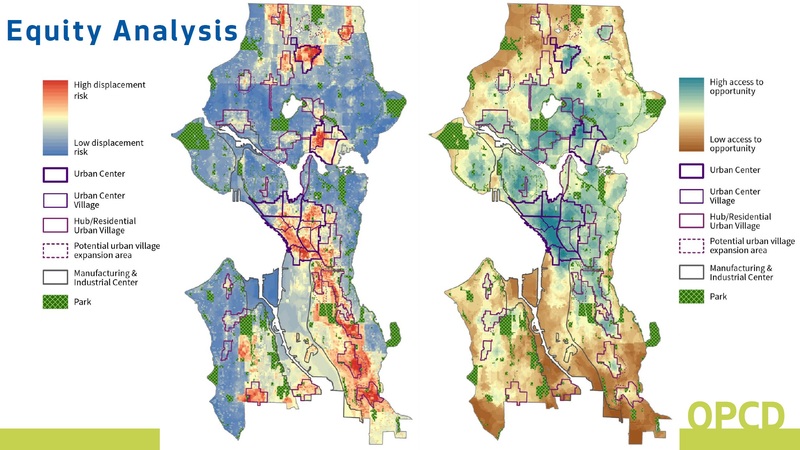 It also limits urban village expansion to a 5-minute walk boundary in the “high displacement risk” neighborhoods. 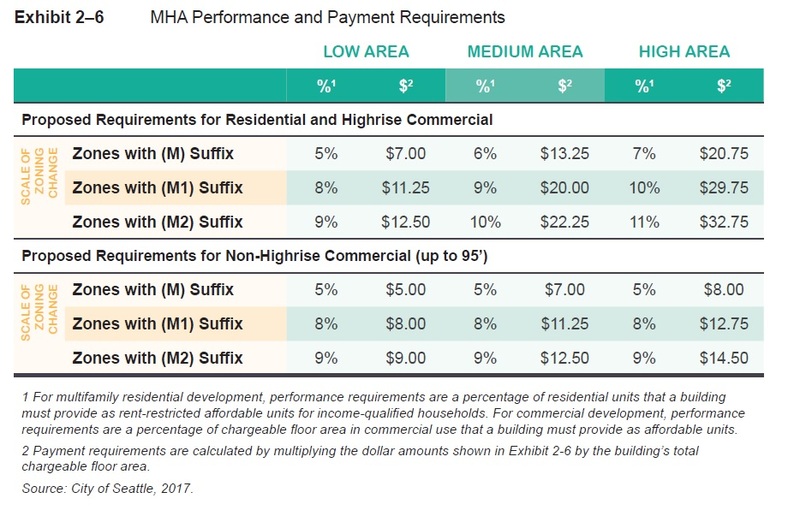 Since the MHA performance and payment requirements are tied to how much additional development capacity is granted, it’s not surprising that building in an “M2” zone requires more than building in an “M” zone. 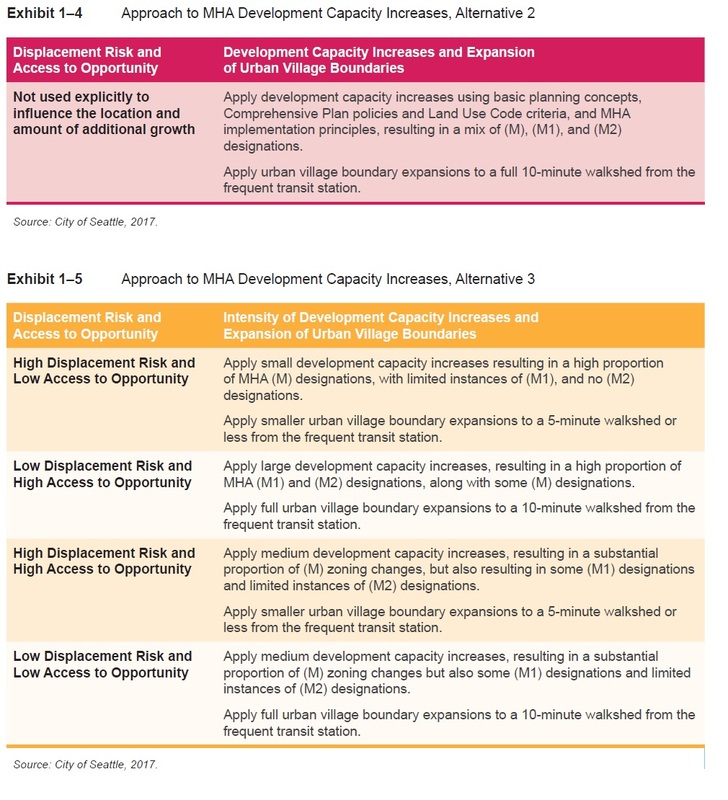 As for changes in how land is zoned, we see some dramatic differences across the three proposals, particularly across the Equitable Development quadrants (for the purposes of this analysis, think of “single family” and “residential small lot” as essentially equivalent, because they mostly are). 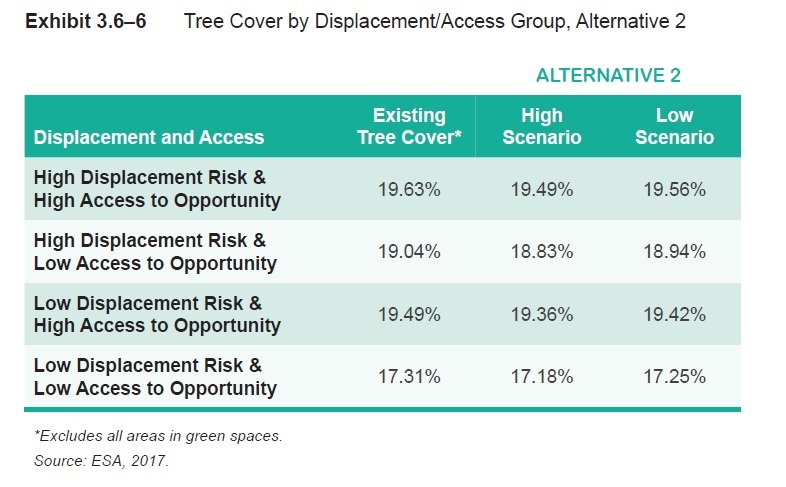 Alternative 2 moderately reduces single-family zoning across the board, while Alternative 3 protects it in high-displacement areas and rips it out in low-displacement areas. Here’s a map of proposed land use across the city. You’ll notice that by far the largest portion of the land is still single family residential — MHA won’t change that. 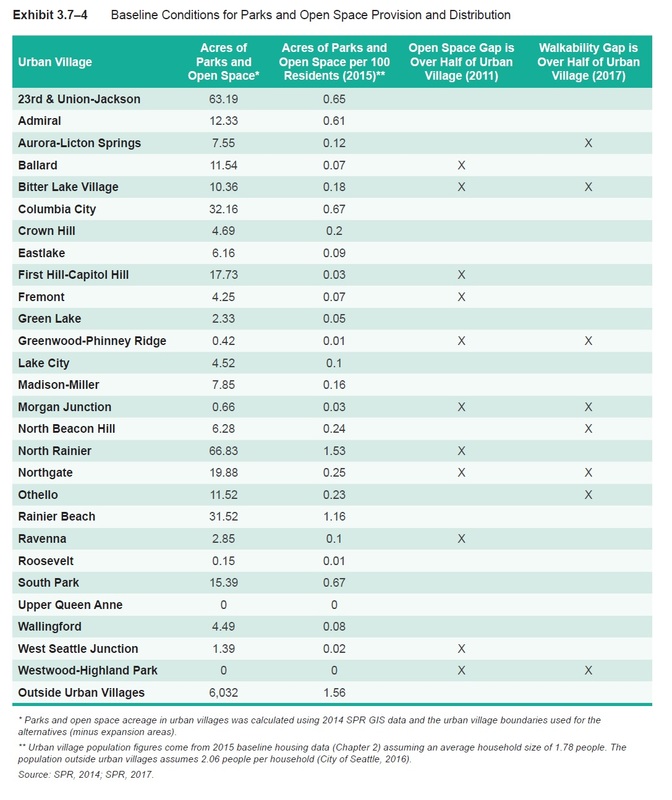 Single family homes are in no way threatened with extinction under HALA and MHA upzones. So now that we understand what Alternatives 2 and 3 propose, we can look at what the Draft EIS says the impacts are of each, as compared to the “no action” alternative. Let’s take this category by category, starting with housing. 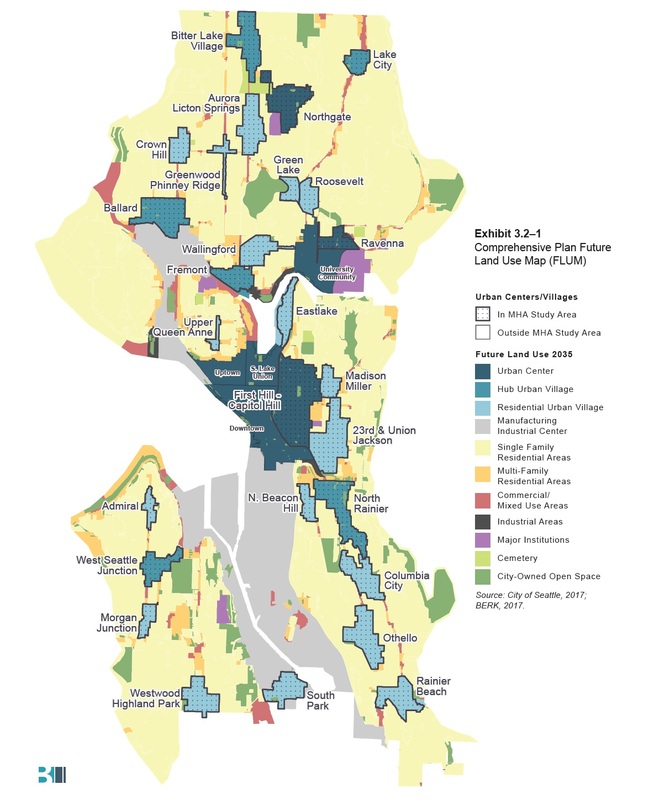 Here’s the baseline of Seattle’s housing today, broken out by type and neighborhood: 338,157 units, heavily skewed to single family homes and larger apartment/condo buildings. 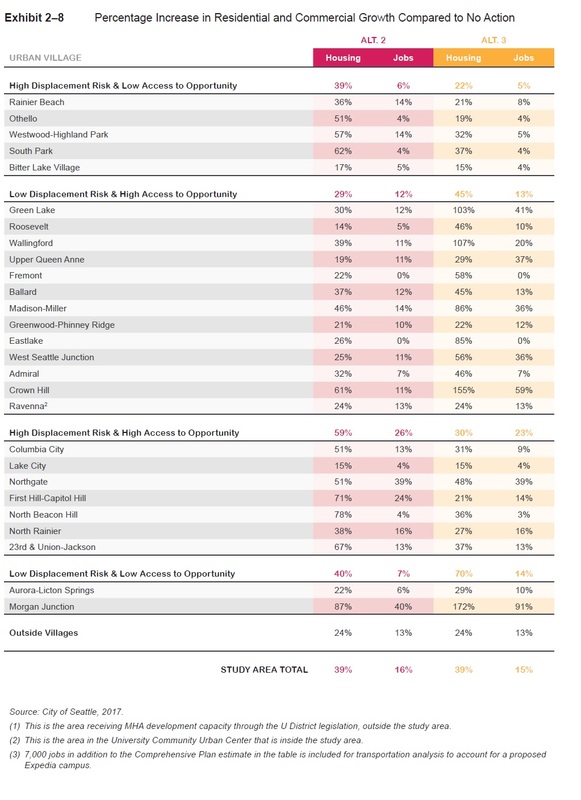 Again, in terms of total housing Alternatives 2 and 3 are not that different; we have to look at individual neighborhoods to see where the impact is. 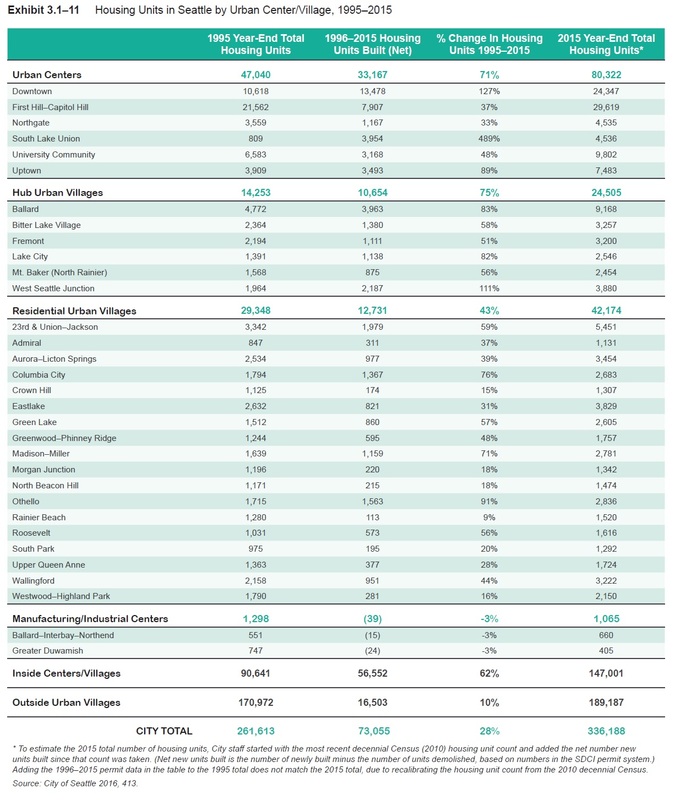 This chart of percentage changes makes it clear which neighborhoods will see the largest, and smallest impact. 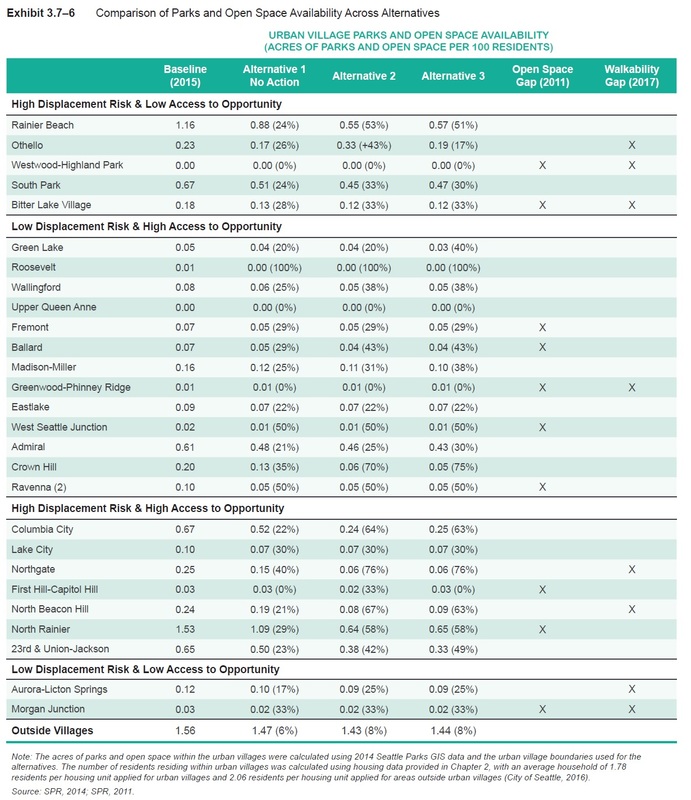 Green Lake, Wallingford, Madison-Miller, Eastlake, and Crown Hill will be most impacted. 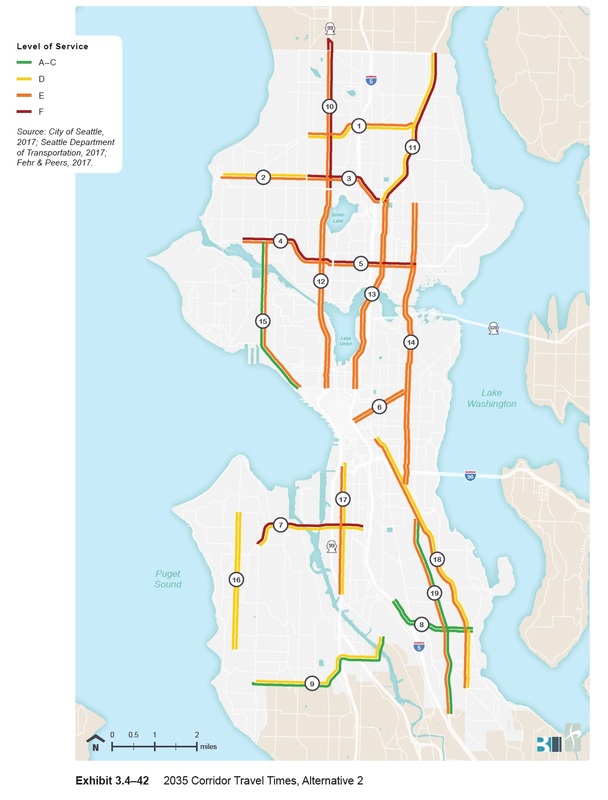 The future looks bleak for car travel in Seattle. 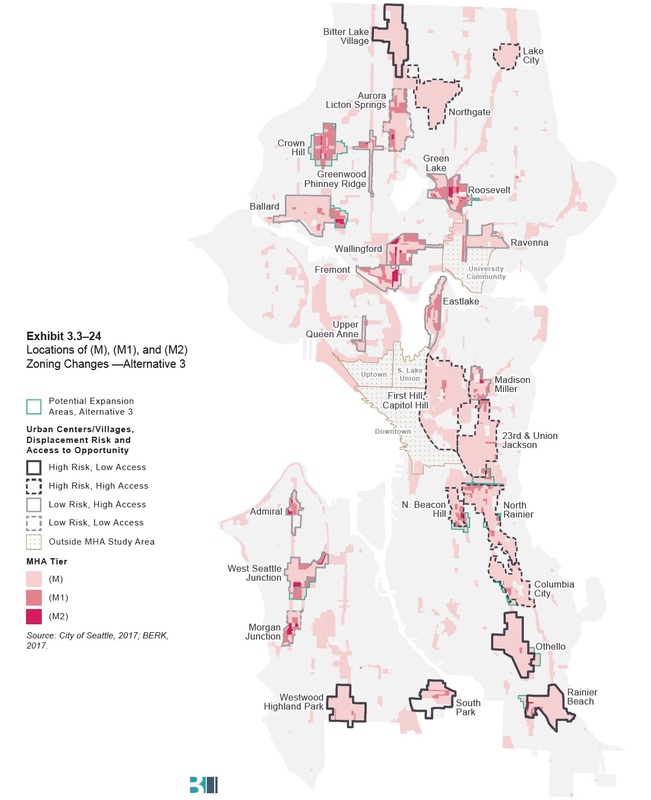 And the only salient difference between the three alternatives is that Section 5 (the University District, Wallingford, Green Lake) gets worse in Alternatives 2 and 3. 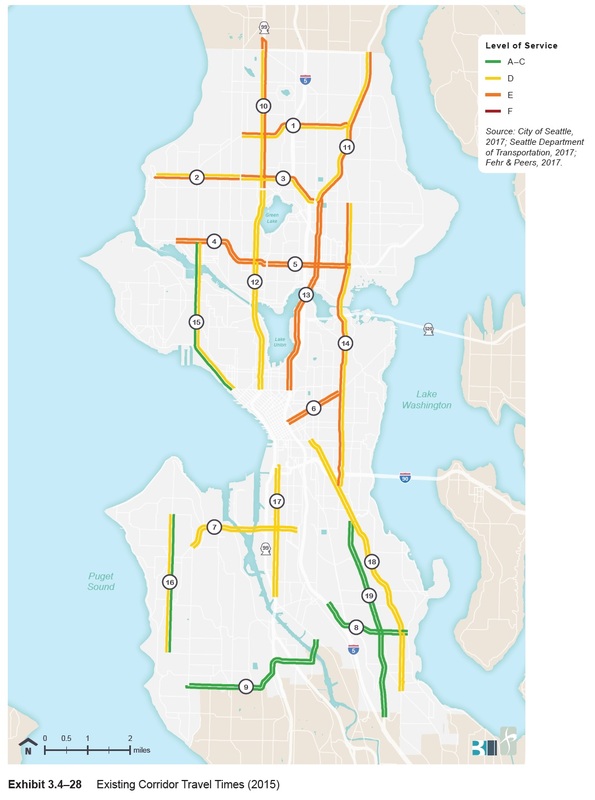 In summary: traffic is going to get worse, but that’s mostly independent of MHA. Street parking will be impacted by MHA, since density will be increasing. Everything else won’t be affected by MHA. Now for some good news: air quality. The air quality in Seattle is very good today. In 20 years, it will be even better. MHA might make it not-quite-as-much-better, though, mostly due to transportation. It’s a fairly negligible change from the “no action” alternative, though. As for parks and open spaces: the city has specific goals for total amount per user, and for proximity to where people live. On total acreage: the city meets it goal today, and can meet this goal in 20 years with a relatively modest increase (about 400 acres). Where it really falls down is in proximity to housing: a large fraction of the parks and open space are in large tracts, some fairly remote (like Discovery Park). This is particularly true for urban villages. MHA won’t fix this; in fact, it is likely to make it worse in several places. Partly this is because new development will be competing for land with potential parks acquisitions. Now, the Incentive Zoning program that is paired with MHA and required for larger projects does require contributions to open spaces, but there aren’t enough of those in urban villages to move the numbers. The city will need a very different plan (and a lot of money) to reach its parks and open space goals. 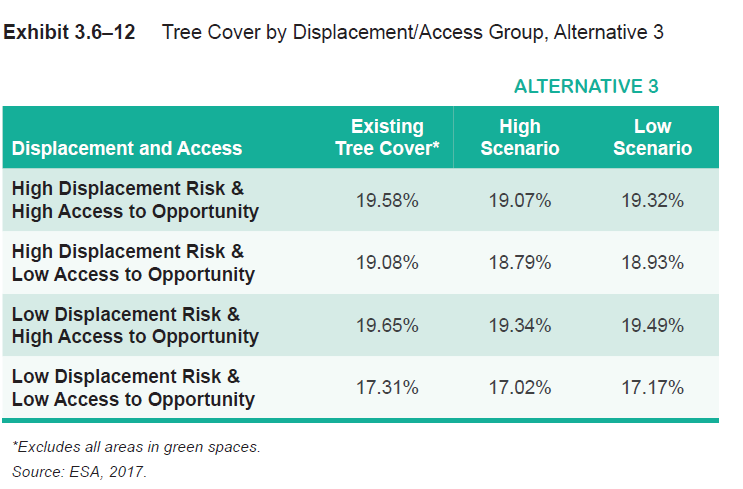 Tree cover is slightly better news: MHA is not expected to change the size of the city’s tree canopy, regardless of which alternative is chosen. There are other impacts discussed in the report: aesthetics (including building heights and design codes), utilities, historic resources, etc. None of them see significant impacts that can’t be mitigated. 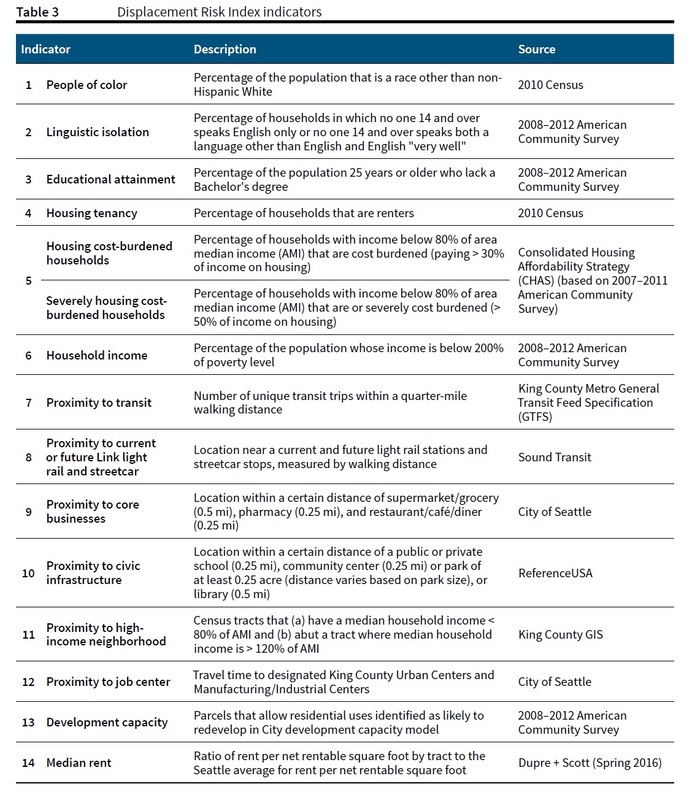 Also, the discussion of housing also dives into the socioeconomic impacts: by race, income level, and other factors. 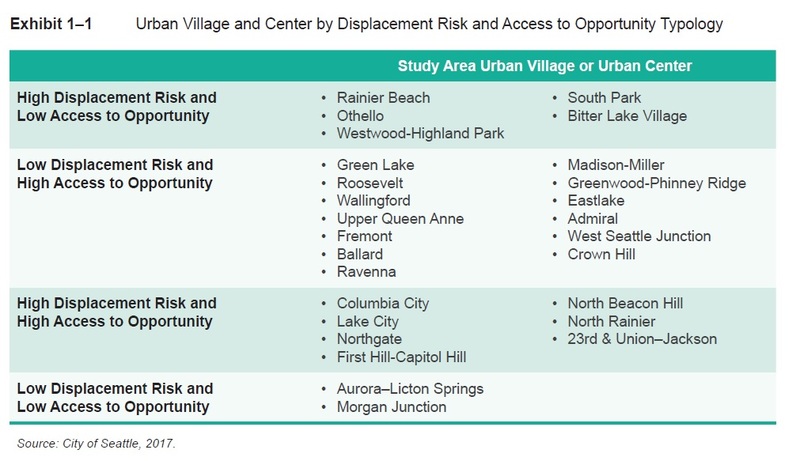 Both Alternatives 2 and 3 are expected to benefit underserved communities over the “no action” alternative, and Alternative 3 benefitting those communities slightly more by more aggressively combatting displacement. The Draft EIS doesn’t claim there are no impacts; on the contrary, there are significant ones. Many are good; some are bad. 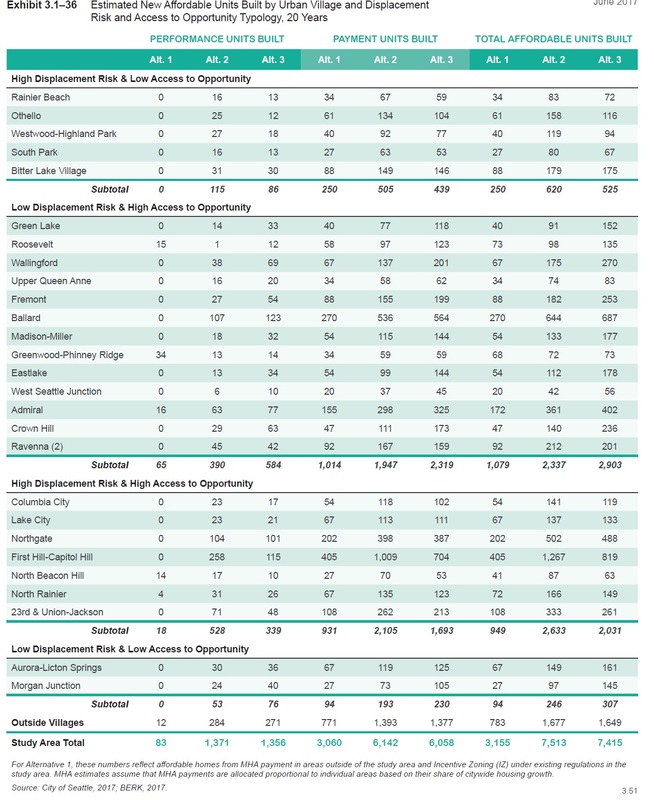 As the discussion of the city-side (or “everywhere else”) MHA legislation moves forward, expect the conversation to shift to policy trade-offs: Wallingford, for example, will get significantly more housing, which may ease price inflation, but at the cost of worse traffic and no additional open space — especially if Alternative 3 is selected. 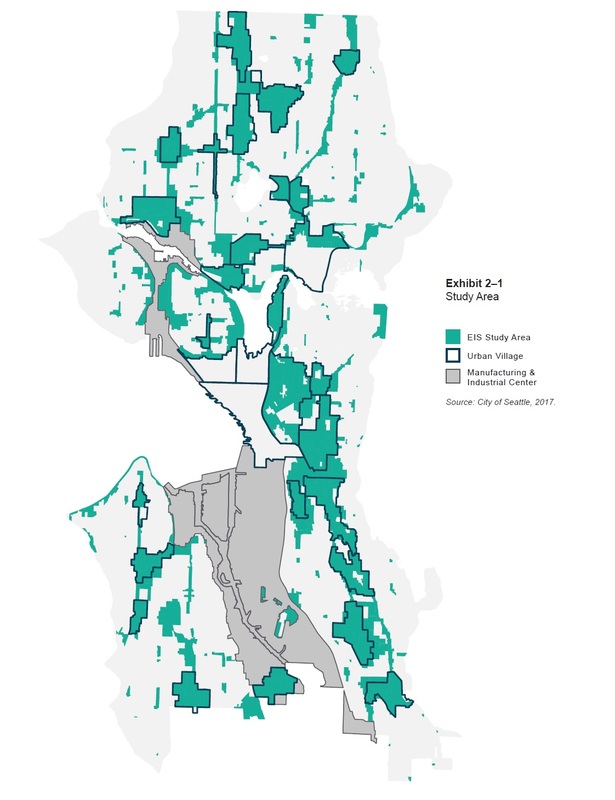 On the other hand, Othello will get more protection from displacement if Alternative 3 is selected — but at the risk of losing urban renewal opportunities and having less housing to accommodate a growing population. There are no perfect answers here. 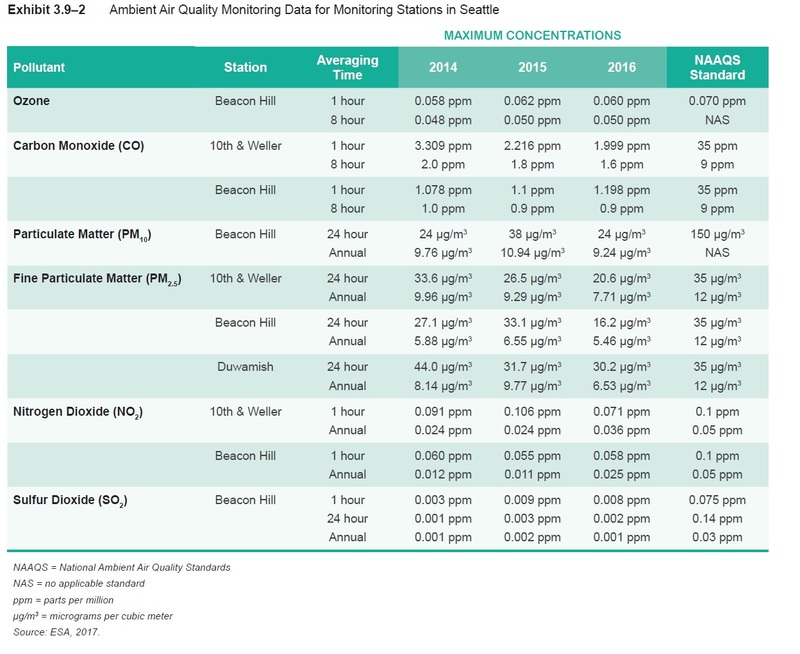 And it’s important for us to be clear about which changes predicted for the next 20 years will happen independent of whether MHA is rolled out across all of the city’s urban villages; to reiterate an earlier point, the pertinent comparison isn’t between the Seattle of today and a Seattle of 2035 that has implemented MHA; instead, it’s between 2035 Seattle without MHA, and 2035 Seattle with it. Whether or not MHA upzones happen, there will be a ton of growth here. The question is whether MHA will make that growth easier to absorb. There will certainly be debate about Alternative 2 or 3 is preferable; city staff chose not to identify a “preferred alternative,” which means it will be up to the City Council to argue that out. And that will be an interesting test of the district-based election system for Council seats, as we see which Council members go to bat for their constituents. This process is just getting started, and it will be a marathon, not a sprint. Generating the final EIS will extend at least through the fall, depending on the volume of comments received. For its part, the Council expects its work on the city-wide MHA implementation to take several months next year. But why do you conclude that Alternative 3 “more aggressively combats displacement”? The city’s own data in the EIS show that loss of low-income households is less likely when there is more private development. It seems to me that more upzones everywhere would be the best strategy. I don’t see how dialing down upzones in high risk areas helps. 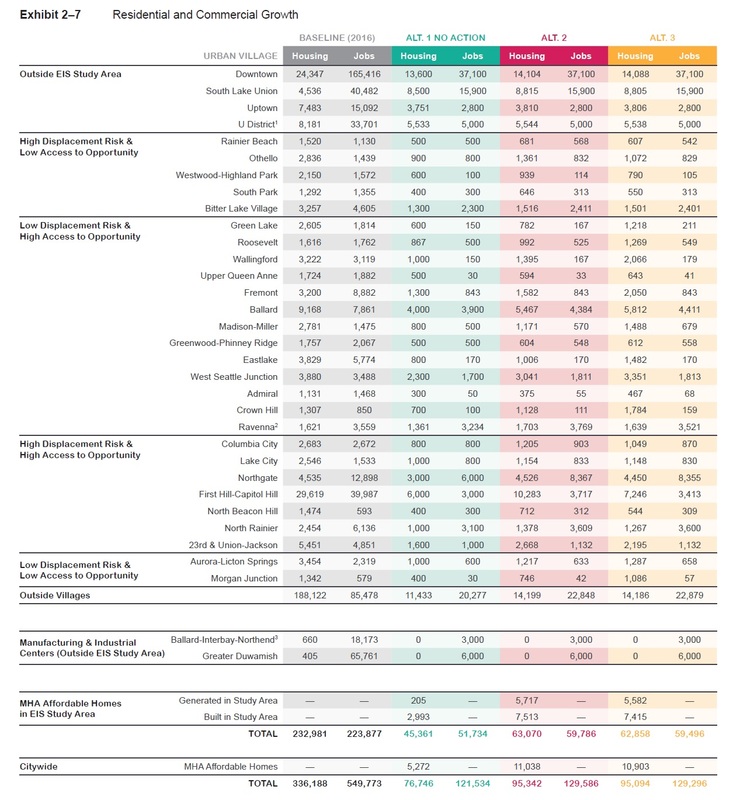 In places like the CD and Chinatown/ID, the prime location alone will drive demand and higher prices, and prices may well rise faster if there’s nothing new built in those places to absorb wealthier households who want to live there. No simple answers here — would love to hear your thoughts. Hi Dan. Thanks for your thoughts. You are right that there are no simple answers here. Displacement takes many forms. Part is being priced out of existing housing. Part is loss of existing affordable housing when buildings are demolished to make room for new housing. And part is when land use changes and existing housing is replaced by non-housing or a different kind of housing. Alternative 3 still upzones everywhere, just less aggressively, with less “M1” and “M2” upzones. 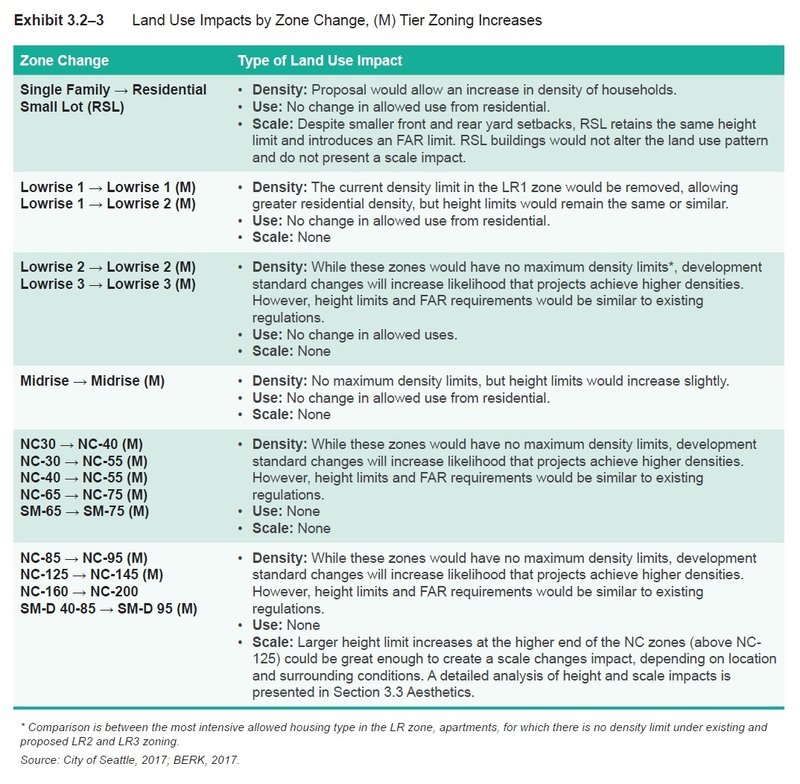 The more aggressive upzones are the ones that would likely lead to changes in land use. Preservation of existing affordable housing is also more at risk with more aggressive upzones. 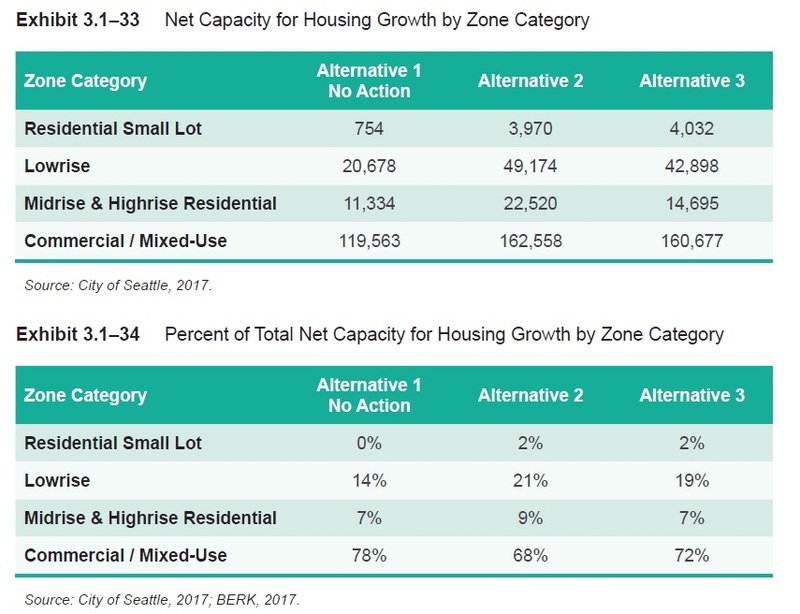 So I think their strategy is to try to thread the needle, allowing enough MHA upzoning to gain affordable housing benefits without risking wholesale changes that could drive more significant displacement. What is neglected here is that it is zone wide up zones, not urban village based, no matter all the focus on urban villages. Areas impacted, historically mis-zoned, with no history of planning and no provision for planning to implement mitigation, will be swept into this up zone. 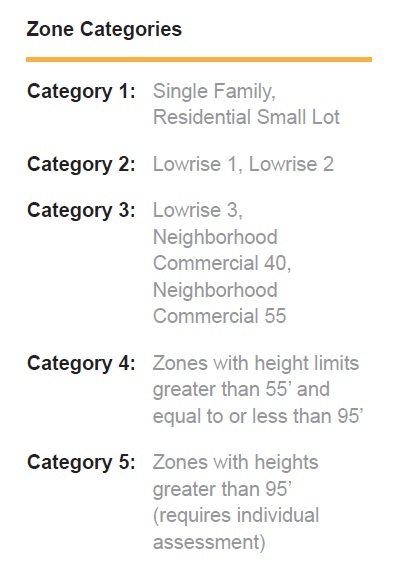 I confess I don’t understand what you mean by “zone wide up zones, not urban village based.” There are well-defined, codified boundaries to the urban villages. They propose extending the boundaries of some of those urban villages, but as near as I can tell they are not proposing changing zoning outside the urban villages. So the vast majority of single-family residential zoned property in the city will remain single-family residential. I object to zonewide up zones and think they should be the outcome of established community planning processes, i.e., Urban VIllage by Urban Village up date to neighborhood plan. The zone wide up zones include all multifamily and neighborhood commercial in the city. You see them colored on the map, and they are not all inside of Urban Villages. Urban Villages have a history of planning, urban design work, analysis of impacts and mitigation work. Urban Villages had Council sponsored charettes to basically update their neighborhood plans in one 3 hour session. Maybe not enough time as people argued, but they were actually working from a starting basis and with neighborhoods who got a planning session and have some history with this stuff. The NC and MF areas outside of UVs may be small in total area, but they will be impacted by this, and different areas will be impacted differently. We get one citywide row ‘outside Urban Villages’ on the DEIS tables which is likely a flat calculation by acreage. Some of those areas arguably should be Urban Villages. 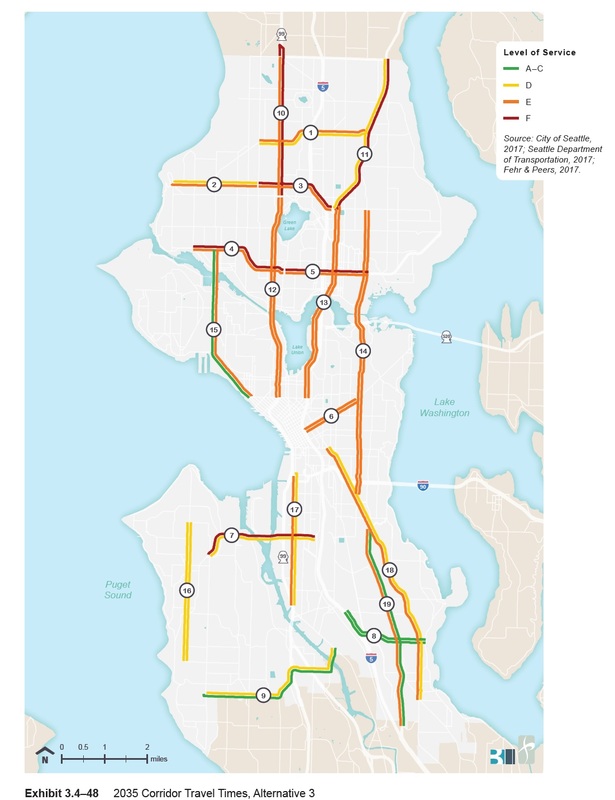 Others will be able to finally access city planning resources under the community planning definition added to Seattle 2035. Being up zoned with no planning process, or history of planning where much is already mis-zoned because of previous citywide action that did not include those people, it’s gonna bite us. 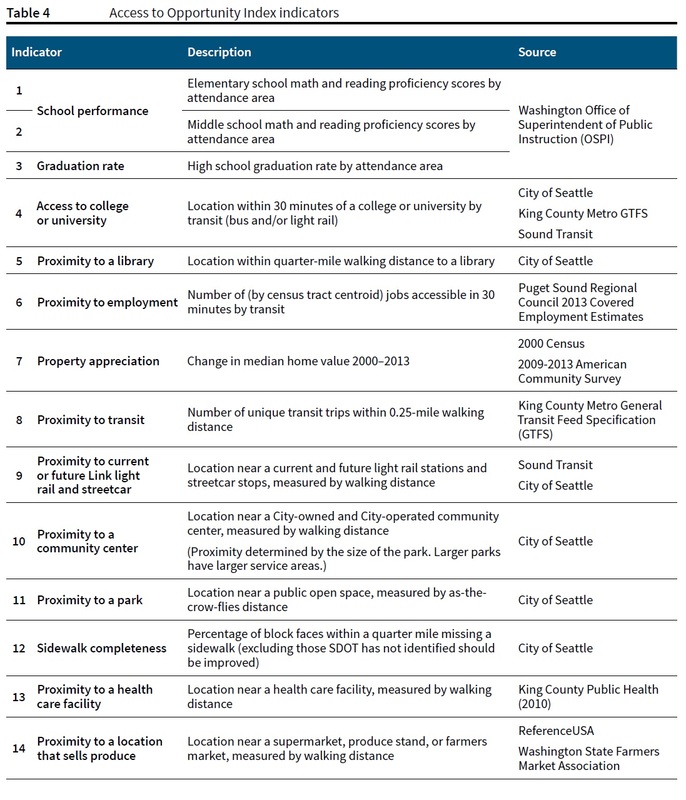 Portland, in contrast, includes ALL of the city in their planning districts — hint. Anyway, it’s not the lede, but analysis and community engagement, and proper planning everywhere, should not be buried and ignored, at least when it comes to legislation.